The PTA Council of Evanston/Skokie presents a new four-part series: Becoming Allies, Inspiring Our Kids to Understand and Stand With Each Other. The series explores the meaning of "allyship" and how to become better allies through listening and supporting one another across differences. The first program in the series, Seeing Each Other in the Stories We Tell, is on Wednesday, October 14 from 6:30-8:30 pm at Family Focus, 2010 Dewey Avenue. Four professional and parent storytellers, Emily Lansana, Jevoid Simmons, Kristine Nesslar, and Danny M. Cohen, share personal journeys navigating issues of identity and social justice with their kids. 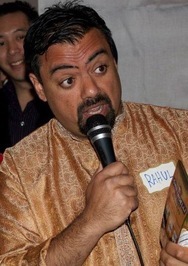 A discussion, facilitated by Rahul Sharma (pictured), will follow to deepen understanding and empower participants to become stronger, more effective allies. Child care and Spanish translation will be provided. 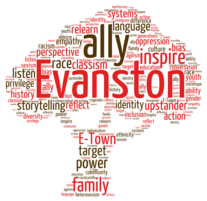 This series of programs on diversity, a continuation of programming started last year, is sponsored by the PTA Council of Evanston/Skokie in partnership with the Evanston Public Library, Evanston/Skokie School District 65, Youth and Opportunities United (Y.O.U. ), Family Focus, YWCA Evanston/North Shore, and the James B. Moran Center for Youth Advocacy. No registration is required. The event is free and open to all. Joyce Bartz, Assistant Superintendent for Special Services at District 65 said of the series, "District 65 is delighted to collaborate with our PTA and community partners to provide this exciting series that continues to highlight our work in developing our diverse partnerships with all students and families." Added Karen Danczak Lyons, "Evanston Public Library, as a vital gathering place open to everyone in the community, welcomes partnerships that extend our reach. This Navigating Diversity series is an example of excellence in programming that has the ability to connect and engage Evanstonians." Future programs in the series include: November 16, 2015: Why knowing yourself, how others view you, and how you view others makes you a better ally. Facilitated by Shabnum Sanghvi and co-facilitated by ETHS students from the Leadership Project. February 2016: What you weren’t taught in school: Systems of power and oppression and a lesson in Evanston history. Presenters: Noor Ali and Dino Robinson. March 2016: The toolbox session: Practical tips for ally development. Presenters: Elisabeth "Biz" Lindsay-Ryan and Sunny Nakae. For more than 140 years, the Library has provided educational, culturally-rich resources for all residents, helped children prepare for school through the joys of reading and learning, celebrated Evanston’s diversity, and helped residents find information they seek. The Library is more than a building of books; it is a place to meet, connect, learn and explore. To learn more, visit www.epl.org.